Ce set est le T2 voleur recolor, disponible dans les héroïques BC. As a feral druid just add Moissonneur du chasseur de sorcières or Lance sonique to this set and voila! Anyone find a cloak that fits with this set? A comment for those being super picky (face it we're vain, it's why we transmog). The shoulders and boots of this and all other level 70 sets are, while based upon, not a precise copy of the original Bloodfang set. The True Bloodfang boots look like sudo-pirate boots with a mid-calf fold down and the shoulders look more like a Scarab shell instead of being inlaid with the runes that stand out here. Are they based on the same set? Yes. Is it a Change? Yes. Just for those being super picky in detail. Cow rogues, It will happen. This set is the recolor of the Tier 2 Bloodfang set for rogues. The items for this set drop in the Burning Crusade 5 mans, with some dropping only in Heroic mode, and some in both Normal & Heroic. I think the Devilshark Cape looks really good with the set. Chemise de travailleur bleue is a good shirt to go with this set. Winterwater Cloak goes great with this set and with the (Replica) Darkmantle set. For those who cannot wait to get a somewhat similar look and want to "fill in the pieces" use the Replica Darkmantle set pieces avail at the darkmoon fair. I know its a pain in the patooty to get those items to drop from heroics, regs you can run over and over (mind you dont hit the max number of instances in an hour). Theyre not the exact match for this set..but it's a similar color scheme and wont stick out like a sore thumb while you grind those heroics. A dagger that fits perfectly with this set is Dague électraile. Ill post pictures as soon as I get the set complete ! Timeslicer / Jaded Crystal Dagger are nice daggers to go with this set. For combat rogues No'Kaled, les éléments de la mort looks really nice, too, especially if you enchant it with Enchantement d'arme (Ouragan) which makes your weapon look like it's covered in a blue electrical storm! If you're a rogue after this set a must do quest is The cypher of damnation in shadowmoon which is a LARGE chain quest which awards you a dagger which is perfect for this set because it has a blue glow ! plus from the same chain which starts from the quest The Hand of Gul'dan in Wildhammer stronghold you get a leather belt which suits the set if you are having trouble getting the one from slave pens Hc! I replaced the boots with Clefthoof Wanderboots because I think they look sleeker and sneakier than the bulky ones for the set. I used the Green Workman's Shirt, it matches the greenish parts of this outfit perfectly. Level 80 raids are easily cleared with two 85 characters. Most likely easy solo clear at 90. The tabard and cloak from undercity match the blue set perfectly....just like the orgimmar tabard and cloak match the red set perfectly...the dark replica set I went with argent dawn tabard <-- which you might not be able to get anymore and the Cheif Brigadier cloak which is a cloak you can try to find on the auction house. Another very nice dagger to go with this set is Griffe du Vol de l'Aile-du-Néant. It's obtained as a quest reward from the quest chain leading up to Netherwing daily quests. Though it's kind of red-ish looking the blue glowing effect pretty much takes over. Chemise de maître bâtisseur looks great with this set. In my opinion the best matching daggers are Perforeuse du gladiateur vengeurs (you can get them for 750 honor in Netherstorm). The only problem is that enchants destroy the look. What about Swords that match this? Just my opinion, but for us sword swinging combat types, Sharde the Lesser is nice, the linky stuff confounds me. A little tip for those farming this set: Armwraps of Disdain, the wrists, are not visiable when using the gloves. So, you can skip the Underbog; save yourself some time and repair money. I think I've found possibly the coolest 'dagger' to go with this set. 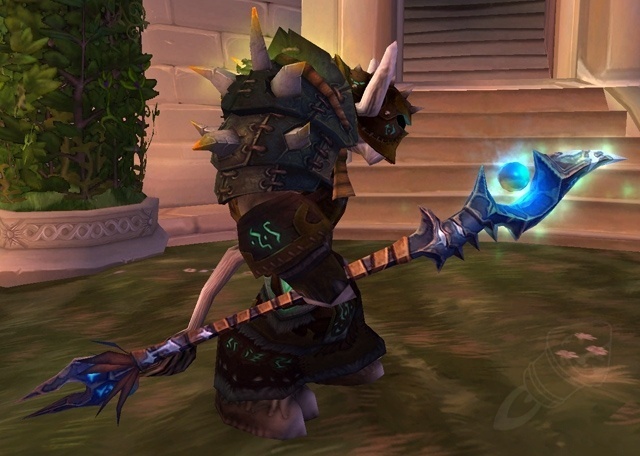 Dague plaie-des-Illidari, which has a blue sword item model. It's from an old quest chain "Éclat plaie-des-Illidari" starting in Shadowmoon Valley. Here is the set I've got finished. La Fureur du maelström is a good dagger that matches this set. It hides enchants (at the very least, Power Torrent), as well. The only problem is that it's a main hand only weapon, so you'd need to find something else for your offhand dagger. Since i see some people having trouble getting the boots, i know some others which fit really well, but aren't boss drops. They are rewarded from a Old Hillsbrad quest. Doublet filigrané en céruléen fits well with this set. It can be obtained easily by visiting Karandonna in Dalaran for 47,50g (33.25g if you're exalted and have the guild perk). Saves some time (and fee) if you don't know a tailor who can make blue shirts. Just thought I'd point out that Réplique des bottes Sombremante actually match the level 60 bloodfang model for Undead males, but with the blue and black coloring, not the ones provided in this transmog set. lf you want a shirt that matches this set exactly, use Doublet filigrané en céruléen. Goûte-sang Fits really well with this set. The mention of Doublet filigrané en céruléen is perhaps the most significant. It is the best shirt match, and really does work a treat. Dagger-wise, Dague électraile will always win. Lame du briseur de monde looks positively hideous in comparison, because it's so bulky. I also known Thrown isn't a big deal to most people, but I like things to match pretty well, and I've found Lames ailées de Lillehoff go best with the colour scheme. Certainly more subtle than Morceau de saronite tranchant anyway. Another great dagger that goes with this set is Griffe du Vol de l'Aile-du-Néant Its obtained from the quest line to unlock the rep for the netherwings. I replaced the Boots of the Unjust with Southshore sneakers....Didnt like the looks of the Boots of the unjust. Southshore Sneakers you get from last Q in Old Hillsbrad. from the quest might look good with this. Update: If you are strugling getting the boots, there is an extremly easy way to get similar ones. Head up to Blade's Edge Mountains and get the quest called "Picking Up Some Power Converters" located in "Toshley´s Station". This is a chain quest, the second quest you get after completing the first one named "Ride the Lightning" rewards you these: http://www.wowhead.com/item=31453#reward-from-q:0+4+1+2 . They look very similar to the originals. Thought you guys should know. Good luck ! For those of you like me, who get impatient to start strutting around in your new transmogged 'Bluefang' set but are having troubles with certain drops. Here's a couple temporary alternatives you can grab to wear with the main pieces and not look like a mismatched hobo, until such time as the set pieces your need drop. Hands:Protège-mains d'entourloupeur world drop off lvl 38-40 mobs, check AH. Belt: Lanière d'Eva rather long questchain in Shadowmoon Valley, starting with "Hand of Gul'dan" given by npc Earthmender Sophurus and ends with "The Cipher of Damnation" turn in to npc Oronok torn heart. Extra accent, Daggers: Tranche-temps dropped by end boss Epoch Hunter in Old Hillsbrad on Heroic mode only. Remember that you -have- to incinerate the 5 orc barracks to activate Thrall and thus Epoch Hunter. Does anyone know any leggings that looks similar to the original ones? Because I've been having really bad luck of getting the original ones to drop :(. For those of you looking for an alternative to the shoulders and helmet, try Darkmantle Cap and Darkmantle Spaulders. Each one is 75 tickets from the Darkmoon Faire, totaling 150 tickets. Don't forget they're BoE, so farm tickets on multiple characters if you have to! The best Tabard for this set is - http://www.wowhead.com/item=23709 Shame it's roughly 200 Euros, so best of luck with buying the cards and finding it within the deck, you'd no doubt spend more acquiring it legitimately than just buying it off of ebay, strangely though; http://www.wowhead.com/item=23705 is only 5-15 euros so this does make me sad. The only other Tabards that match well are mainly alliance pvp ones: http://www.wowhead.com/item=15198 http://www.wowhead.com/item=15196 with the exception of perhaps the horde pvp tabard from AV: http://www.wowhead.com/item=19031 however I find this too bright, failing all of these there's the overpriced yet fairly easy to obtain: http://www.wowhead.com/item=52252 which looks epic, unfortunately doesn't match very well either though. It would seem the Tabard de givre would be the best one (but comes with a high price tag). Failing all of these you could just design your own guild Tabard to look roughly the same as the set. A good fist weapon for this set is Lame de bras drakônide. Staff of Solemn Secrecy Neat. Greatstaff of the Leviathan Licky. Apostle of Argus Glowy and straight. Shaft of Glacial Ice Glowy and pointy. Ti'tahk the Steps of Time Glowy, Demonic, Deadly. Just epic. It's worth noting that the bracers are absolutely unnecessary, since the gloves cover up the entire bracer area anyway. anyone know of a belt that could mach this? looks good for a temp belt. I've mixed this Bloodfang Recolor set with some of the Throne of Thunder and Black Temple items, thought Id share the look of it, http://www.wowhead.com/compare?items=27765:27787:28396:27514:28124:32235:94805:24766:96406, although it might take a while to get, as some pieces are heroic. Hello guys. Is possible get "more" dark set? I have this http://eu.battle.net/wow/en/character/runetotem/Vaciatko/simple. Cape de fleurs joyeuses is the best match for cloak. mistscape cloak has colored clasps at the collarbone that do not match the set. I wear Chemise bleue martiale underneath. If you want to see what this looks like on your character, here's the scripts. Use the addon Paste to get them all in at once. Hey guys i just want to add my weapon choice for this transmog. Its the Epée longue du feu-sorcier . Stormreaver Warblades is a nice Fist Weapon for the set. Cloak of Coordination works very well with this set, too. 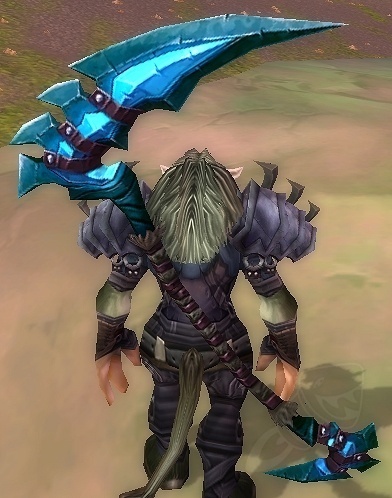 An example of a matching 1h Katana for this set is Taurajo Butcher's Blade (Horde only), the Dagger equivalent would be the Permafrost Dagger. For a Fist weapon you might consider Claw of Celebras or one of its lookalikes. A good matching tabard would be the August Celestials Tabard. My vote for the easiest-to-obtain matching cloak would be the Cape en laine obtained through Tailoring skill 75. There are a total of 3 color variations of this set, all Leather only. Please see linked comments for obtaining each set piece. A great two-handed weapon to go with this (For all you monks and druids out there), is Moissonneur du chasseur de sorcières. Or you could use Grand bâton du léviathan, if you would prefer a "creepier" vibe. Or if you just like tongues. My personal favorite weapon for this set is Averse de grêle. Especially if you are a WW Monk (as a monk it sheathes on back, like every weapon). Even though my class doesnt normally wear Leather, i'm trying to get this set for a awesome RP look. - 2H: Moissonneur du chasseur de sorcières and Lance sonique as stated several times in the comments already. - 1H Weapon: I think Stalagmite noire matches the best. It's like it's made for this. Another option, which is alliance only is Hache d'armes du long-voyant. Hope this helps other fellow Monks. I think they go well and give it a little flair. This set+ Cryptfiend's Bite and Cerulean Filigreed Doublet. meanwhile you farm the legs, you can use Trickster's Leggings, the colour schematic is very similar to the set. As a Feral Druid I always go with Glace noire. I use Clefthoof Gloves and Clefthoof Wanderboots with this set - I feel like it looks a lot 'sleeker'. If you are having trouble getting the pants to drop, Pantalon en cuir robuste match the coloring pretty well and can usually be found in the Auction House. By the time you get the belt and leggings to drop for this set you will have switched mains. I made these macros to make it easier to quickly check what you have collected, and what is missing from your collection. Copy and paste each macro in the chat. You need this to make the next one work. All this does is makes a shortcut to check if you own an appearance or not. Use the information above or in the comments to figure out where to go to farm these particular items. Looks so great with Raven Lord mount! I almsot got the full set excluding the belt and bracer's. All i'm missing is the boots, and the legs. A pretty good replacement for the boots is the . took about 5 hours in total, I did 3 of the hreoic one across 3 characters.